Alice in Sussex written and illustrated by Nicholas Mahler. Published by Suhrkamp Verlag Gmbh (Mar 2013). Softback. German graphic novel in which Alice chases the White Rabbit down his rabbit-hole in search of an illustrated edition of Austrian poet H. C. Artmann’s Frankenstein in Sussex. Alice is back in Wonderland. Here she meets the White Rabbit, who leads her down into his rabbit hole in search of an illustrated edition of H. C. Artmann’s Frankenstein in Sussex. Over the course of the novel Alice repeatedly runs into the Rabbit who quotes freely from other literary works by the likes of Herman Melville and E. M. Cioran. Unlike in Carroll’s classic, this Alice is not in Wonderland but rather in a house deep beneath the ground. On subsequent floors she encounters the famous creations of Lewis Carroll: the Hookah-Smoking Caterpillar, the Cheshire Cat, the Mock Turtle, and many others. One after the other, these creatures address the terrors of childhood and youth. When Alice reaches the ground floor of the house she comes face to face with Frankenstein’s Monster, whereupon she awakes from her terrifying dream. Alice’s Bloody Adventures in Wonderland by Lewis Carroll and Raul Contreras. Published by Demented Entertainment (19 Jun 2013). Hardback, no dustjacket. A new demented modern interpretation of Alice’s Adventures in Wonderland. With illustrations by Los Angeles based street artist Tweedle Guns. The White Rabbit has killed Alice’s Sister and cat. Sending her on a revenge quest down the rabbit hole. Alice finds herself a pawn in a deadly battle for supremacy of Wonderland. I love the illustrations: they use Tenniel as a jumping off point, but leap a pretty long way. 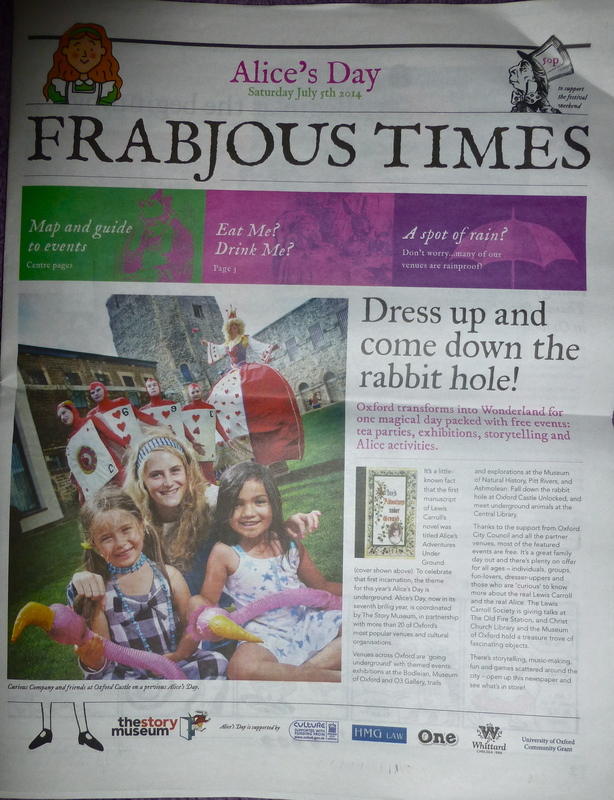 Local double ended paper advertising the events taking place in Oxford on 2014’s Alice Day (July 5th). Lots of cool stuff in there: I just wish I could go! And I wish I still had a scanner. Some things don’t photograph well. Donated by a kindly colleague: thanks!